In the latest instalment of letters from Kilkenny native James Wall Scully, the Irishman tells his wife of manoeuvres by Union forces towards Corinth, Mississippi. He laments his continued failure to hear news of a commission, and grows concerned as he has not received news from home. Meanwhile there is news of promotion for his friend and benefactor Alvan Gillem. Thanks to Anthony McCan for making these unpublished letters available to readers of Irish in the American Civil War. We moved our camp on yesterday to this place which is about a mile south of Hamburg Landing on the Tenn. river. Just as we got fixed to stay for some time, an order came from Genl. Halleck that we should advance in the morning, as New Orleans is captured and the Rebels would be likely to try and evacuate Corinth, as they are now nearly surrounded. I am certain that six days will not pass over before we have a battle. If we whip them here we will not go any further south but cross over and meet Burnsides somewhere in South Carolina Chivalry… perhaps we might go to Charleston and then I might see my sisters. I am afraid that this sudden move will put an end to my speculations of going to see you. 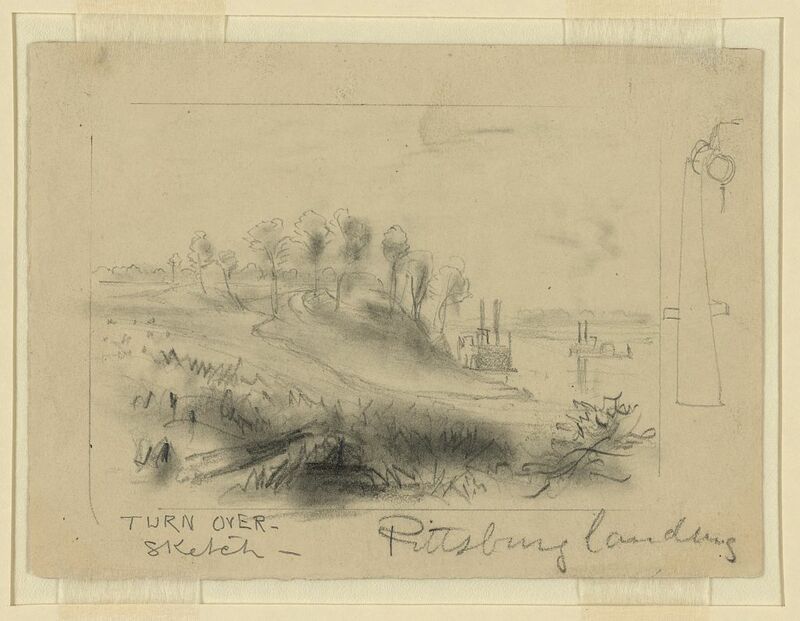 When the order came to move last night, I was sent to Pittsburg Landing with a dispatch and, on my way back to Camp, I got lost in the woods, and as it was pitch dark I did not get back until morning. I had no place to lie down as the mud was about 4 feet deep and you can guess how I suffered as it commenced to rain about one oclock and kept it up until morning – I had no overcoat and got wet through – I felt so bad I actually cried to think all I have gone through and all for the one effect and then to see no sign of getting it. I told G. [Gillem] how I felt and he gave me his word that I would not be disappointed. I cannot tell you on paper all I have gone through and all the danger I have gone through to serve the U.S. since I came out here, but please God I will have a chance soon to tell you with your precious head resting on my arm. I came out as clerk with Capt. Gillem and I have never yet been employed as such – I have to Soldier just as much as ever. I am gong over to see Genl. Bob McCook in the afternoon, he sent for me this morning, he is going to write to Sec. Stanton for me. They are school-fellows and started in law together, and Bob saw my actions at Mill Springs where he expressed on the field that “he wished to God Scully had that battery of Standerts”. I wish I could get to see you and I would go myself to Washington. The two infantry companies from Key West are here. I went to see Libby the other day – he is well and looks first-rate – he won $1900.00 on the steamboat coming from St. Louis – all of “Black Lips”. He told me that Tully cut up fine at Key West after he got his appointment. He used to go charging up to the Saltpond every evening with Mrs Clapp and he got tight one day and went into nearly every Big House on the Key – he thought his being an officer entitled him to go any place. He got into some rows and had to be brought home by [illegible] Libby has distinguished himself again at Island No. 10. He was surprised to see me out here. Address as before, only put Army of the Ohio, Tenn. river. I have not received a letter from you in a long time, the last one was dated April 12th – I hope you have not delayed writing on account of me not sending you an envelope. I have none of my own and have to borrow them from G. [Gillem] I am sick with the diarrhoe but not very bad. It is on account of the “stench” while encamped on the battleground – It was horrible! There must have been many of the wounded Rebels died on their retreat from the battle, as the road is strewn with graves. I counted 121 new made graves on the sides of the road today and one man was buried in the wagon track and one of our wagon wheels went right through him. Such is war! I don’t know when I will see you, but you must take good care of yourself and Sissy, and if any sickness happens to appear at Fort McHenry again, move right away whatever it costs. It was that accursed place that took away my darling child! I have no news to tell you but that Genl. McCook wrote to Washington for me. Before this reaches you, you will, in all probability, hear of a great battle or the “evacuation” of Corinth. I have not received a letter from you since the 12th of April, and I cannot imagine why. I am sure I wrote you enough since the Battle of Shiloh to convince you that I am still alive and of course expecting your letters, but perhaps it may be the fault of the mail, although we get them very regularly. We have just heard of the evacuation of Yorktown and the pursuit of the enemy by McClelland. I am afraid they may come into Tennessee and surround our brave army before we get a chance at Beauregard, but we have one hundred and twenty thousand of as brave and as well disciplined troops as stands this earth; and all the Rebels in “Dixie” can’t clean them out now. If the enemy are still at Corinth, we will commence the battle some time tomorrow. Some of the Generals think they have left there, as they went within a mile of the works today without encountering any pickets, but Genls. Buell and Halleck are too cautious to be caught in a trap and prefer disbelieving the report, and closing up on them gradually, than running the risk of being ambuscaded. This place is all a dense wood, and you could not see a half a mile ahead – so it is better to be ready for any emergency than to rush ahead. Gillem has been promoted Colonel of the 3rd Kentucky Cavalry. He has accepted it and received his Commissions from the Governor. He has written to Washington for permission to take it and as Genl. Buell has approved of it, he has no doubt but that he will get it. Of course, he will still retain his position in the Regular Army, as the Colonelcy will only be for the war. I don’t know what he will do with me, but he asked me how I liked to go into the Vol. Cavalry – I said nothing – he takes it as a matter of course that I’ll go with him. I suppose he will either make me Adjutant or give me a Company. No account of my Comm. yet – NO MATTER. I can’t imagine what is the reason I don’t get a letter from you. I have written every other day and it is now nearly a whole month since I heard from you. Why is it? There are more letters to follow from James Wall Scully, as his attempt to receive a commission continues.